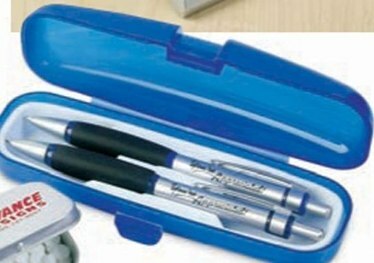 Bulk discount Comfort Metal Pen and Pencil Set in classy matching gift box. Brushed silver finish and silicone finger grips for comfort. Very good quality at the lowest price in USA and Canada. Free artwork design. We will send you a proof for your approval before production. Size: 5 1/2" x 1/2" diameter. Imprint Size: Silkscreen 1 1/4" x 1/2" or Laser 1 1/8" x 3/16"
Unit prices below include your 1-color imprint, or are for blank (not imprinted) wholesale metal pen and pencil sets. You may order any in-between quantity.